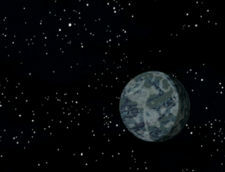 Chapek 9 (also known as the Robot Homeworld) is a planet inhabited entirely by robots. These robots left Earth to pursue a life free from humans. Their anti-human laws are very strict, and violators are executed. As a result, tourism is rather low. Like many other civilizations, its citizens live and work in major metropolitan areas. The streets are setup systematically and lined with popular attractions, such as movie theaters and policed by the Anti Human Patrol. The planet's cities continue to thrive and grow with new construction projects and improvements, with the exception of a few outlying areas littered with human-traps and an abandoned Robot Adult Bookstore. Despite its anti-human laws, Chapek 9 is a member of DOOP. Perhaps this is due to the fact that humans gave them lugnuts at the end of the episode. The planet's cities are lined with anti-human posters and messages. The planet appears to have a conventional justice system. Within the Halls Of Justice there is a courtroom with a Robot Judge, prisoner's box and prosecuting attorney. Chapek 9 is, however, actually ruled by a corrupt council of Robot Elders who use a Ceremonial Killamajig to kill humans. Chapek 9 is named for the Capek brothers; Josef coined the word 'robot' (from the Czech robota- 'serf labour' or 'drudgery') and the famous writer Karel first put 'robot' in print, in his play R.U.R. (1921). Afternoon Rush Hour on Chapek 9 lasts from 12:00pm to 12:01pm. The Daily Human Hunt begins at 5:00pm. A poster is seen while Leela and Fry are sneaking into the city that resembles the Uncle Sam "I Want You For U.S. Army" poster. This page was last edited on 28 December 2015, at 21:04.